It wasn't too long ago when slightly oversized bowls of alkaline noodles in a savoury broth, with optional toppings of a stewed boiled egg, pork slablets and bamboo shoots, were but a footnote in the minds of local diners. 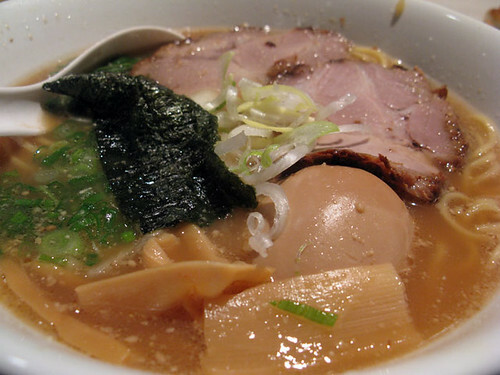 Born in China but perfected in Japan, ramen has fed the cityzens of a post-feudal island state since the 1860s, when hand-pulled noodles known as shina soba were introduced to the archipelago. By the 1920s, batteries of la mien carts had conquered the empire, while fresh supplies of wheat in the post-war years encouraged the flourishing of regional variations as well as the experimental machinations of a man called Momofuku. Sapporo becoming a shrine for fans of a distinctive blend of miso and pork, Tokyo emerged as the capital of tsukemen, a double serving of undressed noodles and a tangy soup for those who like their noodles in the dip end, and in Japan's deep south, the black hogs of Kagoshima provide the bones to pick for a fragrant tonkotsu. Today, ramen fills the bellies of urban decay from Tokyo to Tampines, giving suits and scruffy shirts alike a fix of energy that fuels the gap in time between Büro and bar as well as a dose of nutrition that satisfies far more than a bite between two buns. Ramen joints now grace every other mall on this island, drawing lines of famished souls every evening with variations on a stocky theme. 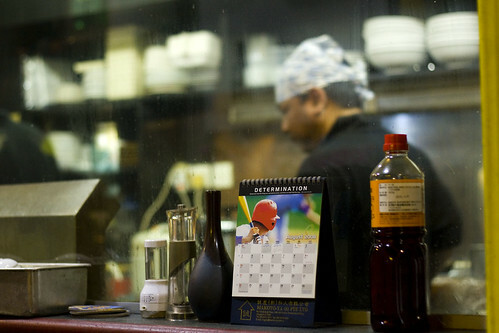 Some establishments bank on pedigree, touting the creations of culinary stalwarts or a faithfulness to far-flung styles. Others, unconstrained by the charters of tradition or compelled by the corporate logic of chained upstarts, eschew the plainness of shio (salt), shoyu (soy sauce) and miso (fermented bean paste), giving pride of placement in their menus to concoctions formulated to satisfy (or scorch) the palates of tropical tastebuds. In the likes of shabu shabu ramen, 'lum lum men', 'burger men', collagen ramen, tom yam ramen, spicy lala ramen and other souped-up atrocities, patrons gifted in aromatic undiscernment and with little inkling of organoleptic nuances can enjoy the best of both worlds in bowls that reek of adventure culinaire but burn with the comfort of all-too familiar flavours. A mall way past its en bloc sell-by date, Orchard Plaza greets passer-bys on the way to classier outfits with a sidewalk of electronics dealers, speedy tailors and tacky souvenirs. For most shoppers, the block is of middling interest, for it boasts no boutiques and offers few marques. The passages within, which tout a balm of clutter and chaos from the dash of a magnificent mile, come to life only at night when restaurants, public houses and karaoke lounges in the upper floors open their doors to feed and water the sons of the rising sun. But for about nine years till this May, a rear portion of the building, far enough from high street to deter casual explorers and nestled amid a tourist trap, was the site of occasional pilgrimage for devotees of noodly appendages who sought to imbibe a dose of craftsmanship that was a world away from the impersonal assemblies of factoried food outlets. A mere hole in the wall in its early years, Noodle House Ken opened in 2003 to a clientele that initially comprised expatriate or visiting salarymen and sundry tourists from nearby hotels. Helming the shop was Kenji Misawa, a former sushi chef who had paid six years of dues at a Japanese restaurant in the Ritz-Carlton. Little else is known about him, save that he was stout, taciturn and probably a staunch believer in the metaphysics of quality who insisted on doing all the cooking himself. Word of his rich double-boiled broth, springy noodles and thick char siew soon got around and a sprinkling of locals began to haunt the house and sample the menu, which was so spartan that a lady, clearly smitten with irredeemable quantities, once sat down, studied the fraying, laminated card and loudly declared to a waitress, "So, is that all you have?" The selection was indeed limited, with a choice of miso and kimuchiramen, plus a curious plate of cold noodles known as hiyashi chuka. Generous cuts of char siew were optional, as were bamboo shoots, butter, nori and Kyushu-style stewed boiled eggs with yolk that seeped out to overpower the senses and run away with your heart. The addictive consistency of the ajitama, which involves a precisely timed immersion of the ova, was probably one of Ken's many trade secrets, as were his sources of wheat noodles and pork. The house of Ken soon grew, taking over a nearby shoplot that furnished the civility of tables and chairs in an airconditioned soundscape of modern jazz. Both portions were amply equipped with Japanese magazines and shelves of indecipherable manga, but only in the original wing could one commune with a soul possessed with the pursuit of perfection in every bowl, if communing could be said to be the hasty act of slurping dunked noodles by a dingy counter before a steamed up wall of glass that separated patrons from Ken and his crew. There was Asahi Super Dry on tap, and gyoza and plum onigiri were available to whet the appetite while one awaited the highlight of a day in a concrete orchard. At some point in the later half of his tenure, Ken revamped his menu, replacing the old tattered cards and adding shio and shoyu ramen to the selection. But not a few detected changes in texture as well as a certain lapse in concentration that signalled, perhaps, a lowering of personal standards or, more likely, the frailties of a man whose heart was failing him. Still, this mere one-man show more than held its own in a market of fancier tricks, welcoming diners faithful and fresh to the day the muse died and bid farewell to a landmark that punched above its weight in the island's culinary landscape. Ken himself remains off the map, in his homeland as a middle-aged fugitive or in the grip of more fatal assaults, and with little hope of a return to form, all that remains after a near-decade of excellence in a sea of lacklustre eateries is a mountain of debt and the memory of his tare.